Lancaster, PA – May 25, 2006 – North Star Marketing has recently been awarded the role as brand consultant to Kroger’s c-store division. Kroger, one of the nation's largest grocery chains, operates 2,507 supermarkets and multi-department stores in 31 states under two-dozen local banners. Their five c-store divisions are under the following names: Kwik Shop, Loaf 'N Jug, Quik Stop, Tom Thumb and Turkey Hill Mini Markets. The division is based in Hutchinson, Kansas. North Star’s role with Kroger’s c-stores can be attributed to the release of The CEO’s Little Black Book on Branding, a new book written by Kae Groshong Wagner, founder of North Star Marketing. It was after reading the book that Kroger executives contacted North Star to begin their branding process. 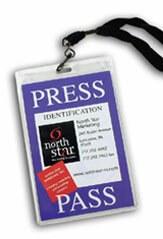 North Star Marketing is a leading full service creative branding and marketing agency specializing in integrated programs that reinforce the brand position long term while increasing sales short term. North Star has 17 years’ experience and a dedicated team of brand specialists who provide nationally and locally known brands with marketing, branding, PR, interactive, advertising, strategic planning, package design, sales communication and creative services. To learn more visit www.northstar-m.com.